Are you a February baby? These earrings would be the perfect set for your next outfit for your birthday celebration. These earrings can also be a great present for someone who was born in February or loved one for Valentine's Day. 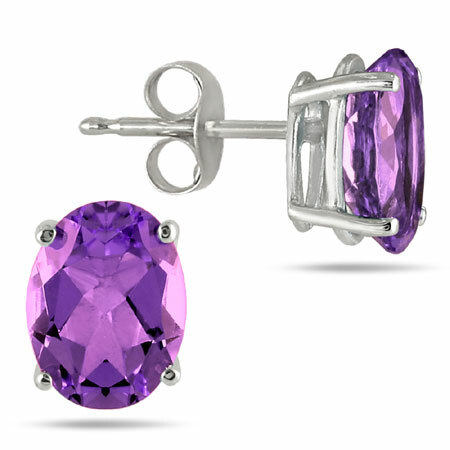 These earrings are made of genuine Amethyst studs that are in the shape of the oval and are complemented by the 14K White Gold background that is a great security to hold the stone in place. The stone is a great way to finish off the perfect outfit order where just to work or school. These earrings are completed with a pushback which enables the earrings to stay on for the duration you are wearing them and the push backs are also best to make sure that there is no discomfort while wearing these items. We guarantee our Genuine 6x4mm Oval-Cut Amethyst Stud Earrings set in 14k White Gold to be high quality, authentic jewelry, as described above.